A Sydney Morning Herald article dated 12 Mar 2019 claimed that an elderly resident of the aged care home at Eden owned by the multi-national BUPA had had maggots growing in a wound in his head to the point where he had to be taken to hospital – the maggots couldn’t just be brushed off by a staff member at the home. We’ve done a lot of work on this over the last 11 days, the bottom lines of which are these. 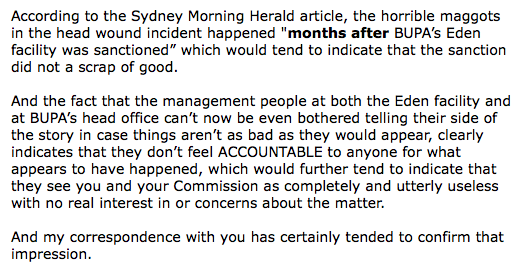 Firstly, we asked the management people at Eden for their side of the story on 14 Mar. 2019 – they haven’t responded in any way. Secondly, we’ve asked the management people at BOPA’s head office, also on 14 Mar. 2019, whether they cared. They responded with this. But that was 11 days ago, and we haven’t heard anything further from them. Thirdly, we’ve had extensive correspondence with the Aged Care Safety and Quality Commission which has just gone round and round in circles getting us nowhere. Eventually we sent them this. We believe that any of our readers considering dealing with any of BUPA’s facilities should at least send an email or two to BUPA’s top management to see whether their responses, if any, encouraged them to think that doing this might be good idea – at least they’ve got an ordinary email address that can be used – info@bupacare.com.au. Unfortunately our work over the last 11 days means that we’d be surprised if anyone who did this ended up thinking it was a good idea. A 29 Mar. 2019 update: No response from BUPA’s Aged Care Home at Eden to an email sent to them 15 days ago using their email form. I read in the UK news that BUPA’s bottom line has taken a hit, both in relation to its Insurance (?) arm and problems Down Under in its Aged Care facilities. Would have to check the details, but I think this is the gist of it.